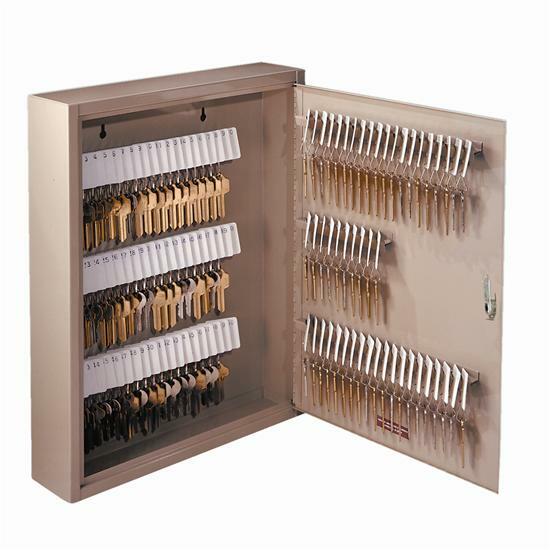 USA Building Supplies carries two different types of key control cabinets that are made out of steel with a scratch resistant finish. Key control cabinets from USA Building Supplies can be offered in single or two tag system. 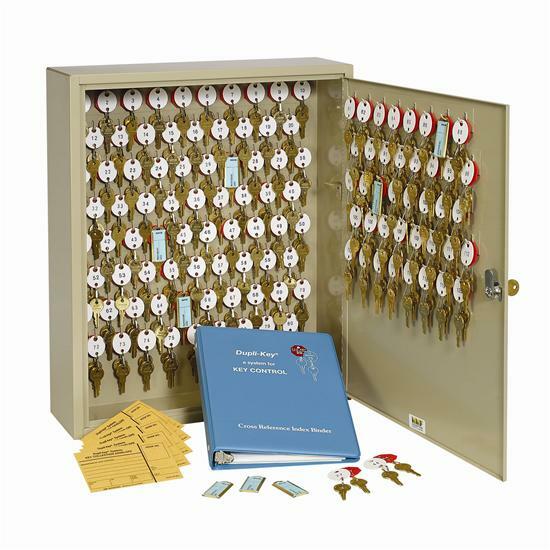 The one tag key cabinet system allows you to attach keys to numbered key tags and file the key tag on the key rack slots, when a key is given out. 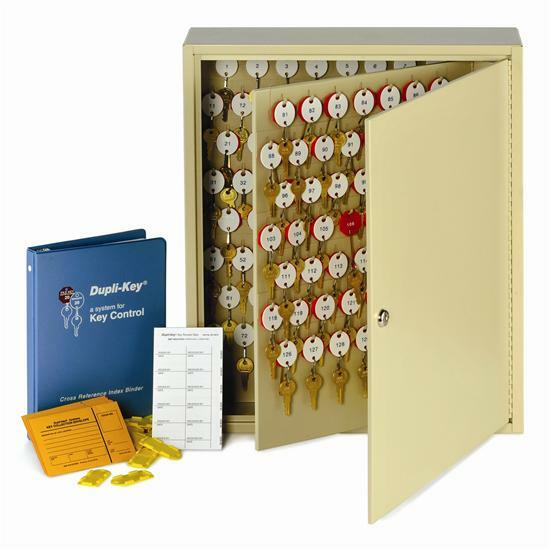 The double key tag cabinet differs from the one tag system because it utilizes two different sets of key tags. The master key in this process is attached to a red octagonal shaped tag to ensure that this key is never loaned out. Both types of key tag cabinets also utilize a receipt system for accountability. Additional accountability is gained by the locking system, which is a standard feature for our cabinets. USA Building Supplies aims to make your life simple with the two tag key control cabinet. Are you tired of lending out keys for your property and having little recourse when the keys go missing? Your life is about to get a whole lot easier with the two tag key cabinet from USA Building Supplies. 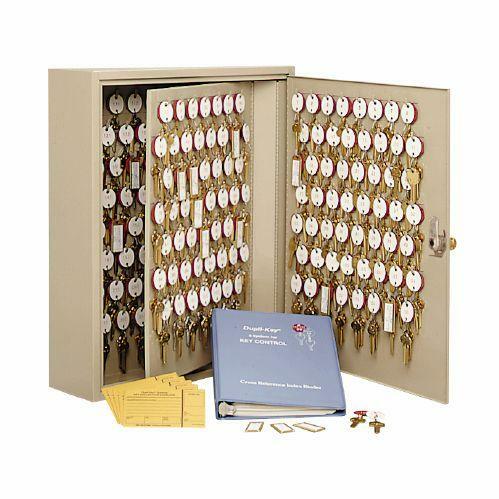 USA Building Supplies two tag key cabinet system makes sure that your master keys are never loaned out by providing red octagonal tags to designate master keys. White oval key tags are furnished to mark the only keys that are allowed to be borrowed. Security for the two tag system is not compromised due to the locking cabinet door. Master keyed locks and keyed alike lock options are available for multiple unit purchases for an up charge upon request. Key cabinets are often surface mounted but can be affixed to shelf or table as well. USA Building Supplies durable steel construction and scratch resistant finish all but guarantees a long product life. Different size key cabinets and capacities ranging from 30 keys up to 460 keys can be ordered from USA Building Supplies. Contact a key control specialist at USA Building Supplies today to make tracking down your keys a whole lot easier. USA Building Supplies is unwavering in our commitment to handle key cabinets that simplify our client's work day. The single tag key control cabinet has a straightforward system that allows the key manager to affix keys to the furnished key tags and put them in the appropriate key slot and finally recording the keys when they are borrowed. Security is never compromised with the uni-tag key control cabinets because it comes with disc tumbler key lock installed. Two keys are furnished with the door lock for the supervisor. Master keyed and keyed alike key cabinets can be accommodated for customers ordering multiple cabinets at one time at an extra cost. Piano hinged doors and panels allow for efficient cabinet operation. 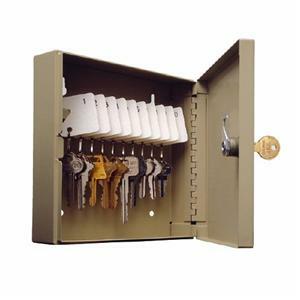 Single tag key cabinets are made of the same durable steel construction with a sand finish as are other key lockers. 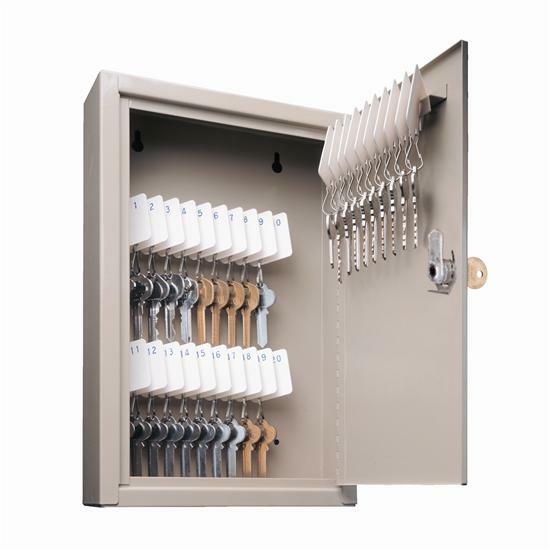 Single key cabinets are offered in an assortment of sizes and capacities ranging from 10 key capacity cabinets to a large 715 key capacity locker. The size of the cabinet usually relates to the overall capacity of the unit. USA Building Supplies predrills all key cabinets for wall mounting. Contact a knowledgeable USA Building Supplies' representative to discuss your key cabinet requirements. USA Building Supplies is proud to announce our new electronic key safe which was designed solve your key control problems. The electronic key safe has a battery operated programmable key pad on the door that eliminates that need for everyday keyed access entry for the supervisor. What happens if the existing supervisor quits and doesn't communicate the combination to his superiors? What happens if the power goes out? USA Building Supplies has even addressed these issues with a removable faceplate that has a back-up lock. Therefore when purchasing an electronic key safe USA Building Supplies advises clients to keep back-up lock keys with a different supervisor for contingency plan. Needless to say we do not want you to store the key override key in the key cabinet. 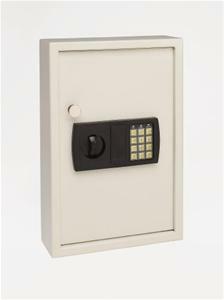 Electronic key cabinets are fabricated from steel with sand color finish. Easy marking key tags in black color are furnished with every electronic key locker. 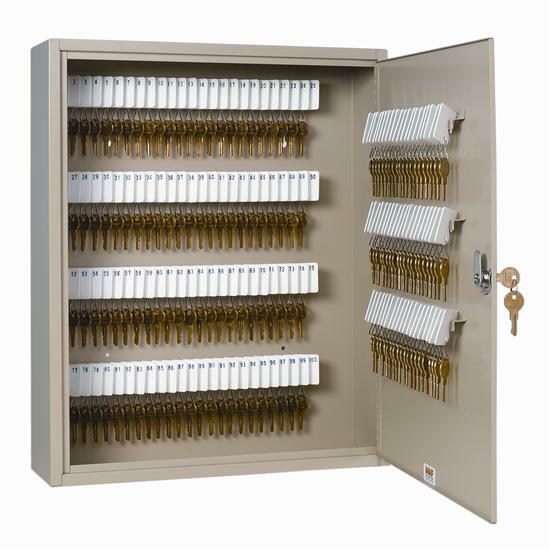 Electronic key cabinet has a 48 key capacity which accommodates most buildings key control requirements. Red light indicator will assist supervisors to know when batteries are low and need to be replaced. USA Building Supplies is pleased to offer another innovative product for our customers to solve their problems. USA Building Supplies realizes that small organizations tend to empower their employees rather extensive policies regarding every detail like the keys for the key control cabinet. What happens when the community manager misplaces the keys for the key cabinet? Is this a major ordeal? The 28 hook key cabinet with a combination lock helps solve this problem. The key cabinet combination can kept with the owner and the supervisor rather master keys being kept by only the supervisor. 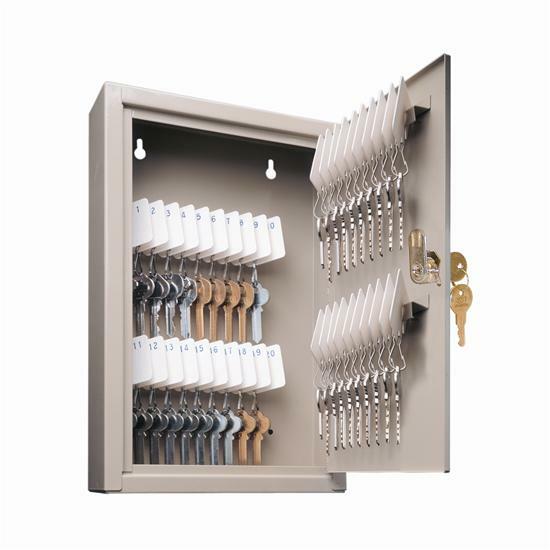 Contact a USA Building Supplies' representative to guide your company to making the best key control cabinet product decisions. 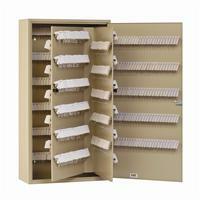 USA Building Supplies offers key control cabinet solutions for your facility whether it is large or small. 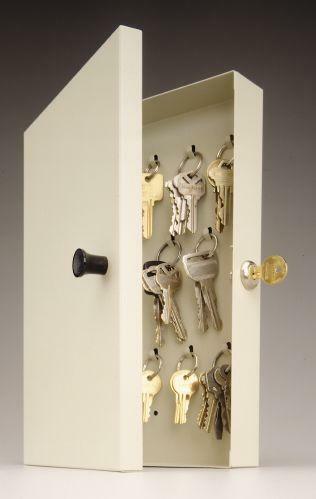 The fourteen key hook key cabinets are used by smaller property owners. 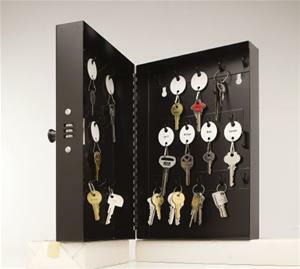 This key cabinet features fourteen key hooks which will allow the owner to store keys regardless whether the key has a key ring. 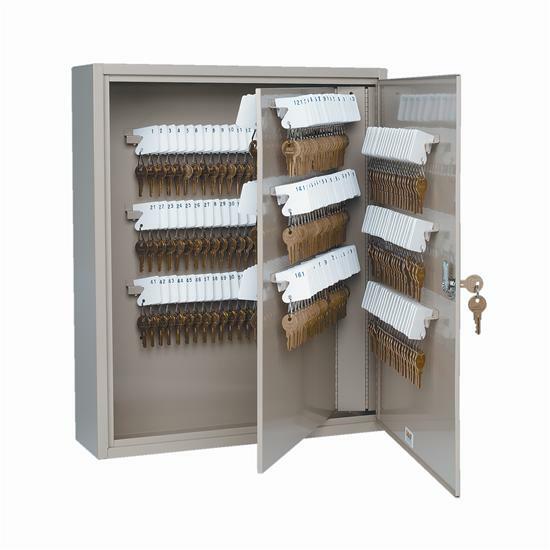 Durability and security are not compromised with the small capacity key cabinets because it is manufactured with same heavy gauge steel and secured with an identical disc lock as our other key cabinets. Installation to the wall is made easy with predrilled holes and factory provided mounting screws. 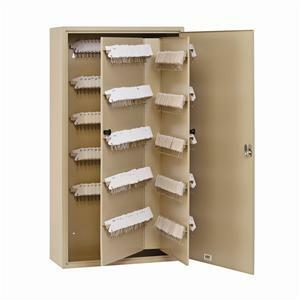 Whether you building are large or small USA Building Supplies has a key control cabinet for you. Key cabinets are utilized by an assortment of companies, government entities, and other types of organizations. Property management companies love USA Building Supplies' key control cabinets because they assist them in staying organized. Rental car agencies often comment about the efficiency of our key cabinets. Schools like the security the cabinets provide them. 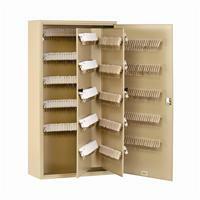 Contact a USA Building Supplies representative to assist you in finding the key control cabinet for your facility.